Warby Parker is more than an ecommerce start up; they are a global lifestyle brand revolutionizing retail with their affordable, vintage-designed eyewear, as well as with their reputation for flawless customer service and charity. The looks are endless, hipster cool and deliver true value. Startup Grind held its monthly panel at AOL Ventures in early October, inviting one of the company’s founders, David Gilboa, as the guest speaker. 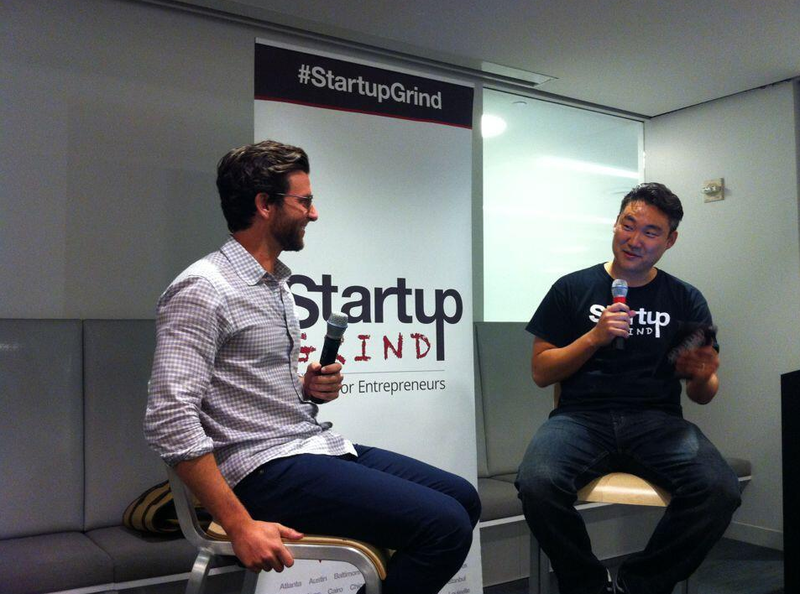 Giimme cofounder and Chapter Director of Startup Grind DC, Brian Park, moderated the fireside chat. Born in Sweden, Gilboa was seven when his parent (both doctors) immigrated to San Diego. His adolescence was rooted in commerce and risk: at 14, he bravely launched a CD-burning business in his bedroom, generating thousands of dollars in revenue. Broadcast and film companies quickly discovered what he was doing – which happened to be illegal – and sent cease and desist orders to the family’s front door. While the venture was short lived, it was obvious to those who knew Gilboa that he had all the makings of an entrepreneur. And he would be a legitimate one, next time out. A Wharton MBA grad and consummate adventurer, who has trekked across the Arctic, Gilboa admitted lacking the design and technology skills that are needed when creating a successful startup. “I knew if it didn’t work out, I could fall back on my graduate degree and land a job at a major corporation. I just didn’t know it could go this far,” he said. Three of Gilboa’s fellow Wharton graduates and close friends, Neil Blumenthal, Andrew Hunt, and Jeffrey Raider, put together a plan using a $120K from their savings to launch Warby Parker (the name comes from two of Jack Kerouac’s earliest characters) in a Philadelphia flat. Frustrated by the lack of styles, the somewhat prohibitive costs of $300 or more for a pair of glasses and the endless months it took to receive them, the four men set out to carve the kind of successful venture all entrepreneurs dream of. The company reached it first-year profit projections in their first three weeks in business, with 200k additional subscribers having been placed on a waiting list—a direct example of how a solid business model can work and how a company can efficiently serve its clientele – all while generating considerable revenue. The articulate Swede illustrated the importance of relationship building to any brand’s success. The company forms a relationship with the customer by providing free shipping and returns, along with a no questions asked guarantee. Another incentive is that when an order is purchased, another pair of eyewear is donated to someone in the world who needs a pair of glasses, but who lacks the resources to purchase them. 80% of eyewear itself is engineered by Luxottica, which owns Oliver Peoples, Oakley, Ray Ban, and a few others Eyewear has been a largely consolidated industry owned by few vendors, who are infamous for charging over $300 a pair and providing limited options, based on comfort and prescription. Among the factors that contribute to Warby Parker’s popularity is the business model. One can access frames both digitally and physically, matching the right fit and look before committing to a purchase. Gilboa cautioned not to waste time trying to raise capital or bring in angel investors when uncertainly looms. When and if you decide to go that route, you must demonstrate to investors significant numbers, a realistic plan for growth, revenue, and product margins with a timetable —things that many tend to overlook when trying to secure funding. The company’s aim is to offer a product at a reasonable price – $95.00 – and to address environmental concerns by remaining carbon neutral. They’re the only brand of their kind that is. For the past two years,Warby Parker has also partnered with boutiques and showrooms in LA, Nashville, San Francisco, and Boston, and have garnered positive praise from both the economic and eco conscious sects. The online operation that has existed since 2010 launched its flagship store early last fall in Soho, with a showroom that is clean, modern and timeless. The company headquarters are also conveniently located in the neighborhood, which is known for its trendsetters —just another reason Warby Parker, with its stylish products, decided to set up camp there. A major component to the rapid rate of the company’s growth was its online presence. Less than 1% of eyewear sales were were conducted online at the time of the company’s inception. They tapped into a market ripe for disruption and word of mouth quickly drove sales. While their brand was reaching cult status, problems such as lack of inventory and preparation for unlikely scenarios are what Gilboa said he would have changed, were he to go back and revamp the overall infrastructure. For a company that has expanded to 130 employees and closed a $41.5 million round in February (supported in part by American Express, and JCrew CEO Millard S. Drexler), Warby Parker is a trailblazer in the retail world – and they’re well on their way to becoming a household name. Startup Grind is a global startup community designed to educate, inspire, and connect entrepreneurs. They host monthly events in more than 50 cities and 20 countries featuring successful local founders, innovators, educators and investors who share personal stories and lessons learned on the road to building great companies. In the last year alone they hosted events featuring an impressive line up including Steve Blank, Chet Kanojia, Esther Dyson, and Jon Steinberg. Learn more and sign up for the Startup Grind NYC newsletter.